How Did You Do On Black Friday?!? Thanks to my wonderful family, I had a really good day of shopping. First my family watched over my littlest son (thanks mom and dad!) and let me take my time. I had a detailed list and did not defer at all from my master list. That in itself was a major accomplishment for me. I hit over 7 different stores, starting at 4AM and finished up about 10AM. I then headed back out that early evening and headed back about 3 1/2 hours later after shopping at WalMart and reviewing and picking up dry product item I could with my coupons. It takes so much time to read, review and decide on buying something. It was a really good shopping trip and I was able to fit it all in the car without having to leave a family member behind. Then I hit up the local WalMart before we arrived back home for my frozen and dairy products. My new pantry was stocked to the core!!! Awesome!!! Talk about a humbling awakening. Nothing else to do, but load up the Explorer once again with about 100 pounds of our abundant overflow and bless another family with what I was able to be blessed with in my major shopping trips. Sometimes it is hard to let go of something that you take pride in, my husband and I have desired to fill our pantry and cabinets to overflowing, but you know we have so much more ability to restock our pantry easily than the next family. It also lets me remember that my ability to score such incredible deals and purchases is not because of my efforts, but only because of and through the blessings I have received from the Lord. Please pray for the Zanugio family. 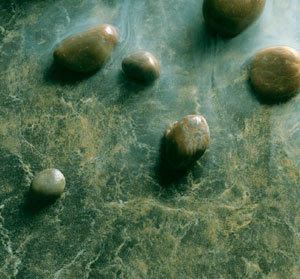 Jade Fusion – Green and gold offset with dark neutral undertones. Good afternoon!!! Doesn't that description sound nice!!! This is a picture of our newly ordered laminate for our kitchen counters. Check out the rest of my posting for more details. Well we had a wonderful Thanksgiving holiday. The best thing about going to see someone for Thanksgiving is that you typically don't have leftover turkey concoctions for the next few weeks. I did end up with some leftovers, courtesy of mom. Thanks Mom!!! I do love her dressing and sweet potato casserole. I haven't even told my husband about the sweet potato leftovers, he loves them and I am not so sure I want to share. My youngest daughter has posted some wonderful family photos, thank you for taking the time to photograph the festivities and post them for all to see. My oldest son posted some good photos as well. We had a wonderful extended visit with our son for most of the holiday week. He helped us out immensely in our kitchen remodeling by scrapping up the old lineoleum flooring. It was a lifesaver. We custom ordered our laminate on our anniversary. You can tell when you have been married for awhile, when you are excited to order laminate for your anniversary gift!!! It has already arrived to the store, so my exhausted DH will be going to pick it up after work and also some wood for building some new cabinet doors and also the wood for the counters. This is an overwhelming project, but he is an excellent builder, so we are excited. He is under a time crunch since we are going to be hosting several family members for Christmas so he was up to over 11pm knocking out cabinets and wall sections. We have hit our first major remodeling glitch. He has discovered a plumbing vent in the wall behind our sink. We were aiming to open up this entire area to the greatroom. I don't know if he will build a faux column around it or will be moving the venting. I am voting for a faux column to cover it up, but he is thinking about it. He is typically a perfectionist so he might try moving it, we'll wait to see what he thinks. I'll try to get some photos posted in the next few days.